Located on the 1st floor of the main house, on the edge of the cliff, this suite is composed of 1 bedroom, 1 bathroom (with bathtub) and 1 living room. It also enjoys a balcony with a view on the Mont Ventoux, and its windows open on the river and the Popes’ Palace. The bedroom may be arranged with 1 double bed (queen size) or 2 twin beds. The living room is equipped with 1 sofa-bed. Maison Orsini is a charming bed and breakfast located in the historic center of Villeneuve-les-Avignon. We offer for rent 5 spacious guest rooms and 2 lodgings arranged around a parish garden and a panoramic terrace. Pool access and free private parking. 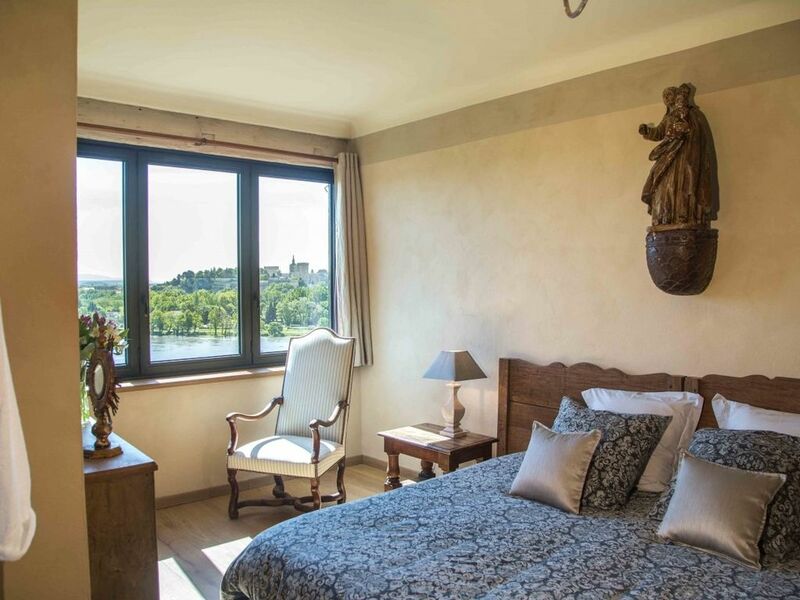 Perched on the foothills of the Philippe-le-Bel Tower and facing the Palais des Papes, Maison Orsini combines the advantages of the quiet of the countryside and all the advantages of the proximity of city life. Ideal for a romantic holiday, family or cultural discovery, its location in the heart of Provence will allow you to browse the historical and gastronomic treasures of the region. An authentic medieval decoration emphasizing the arts and ancient craftsmanship make it an exceptional and unique place in the region.